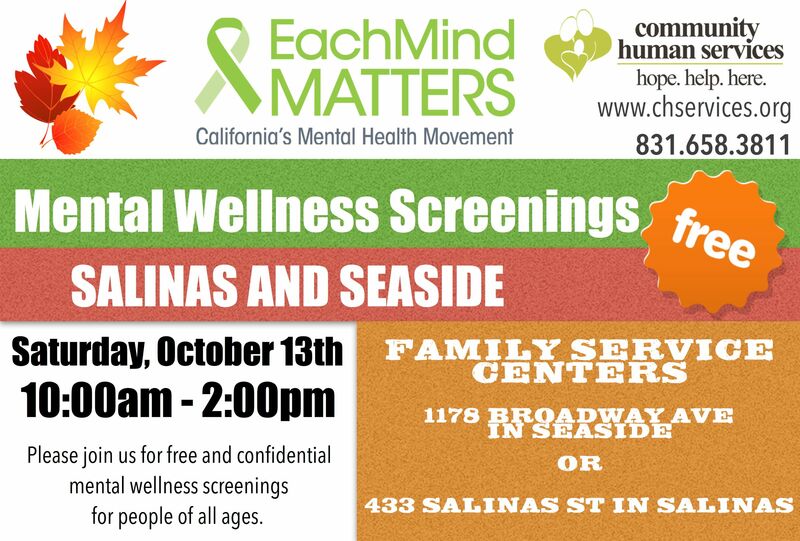 On Saturday, October 13th from 10:00am – 2:00pm, Community Human Services’ Family Service Centers will offer free and anonymous mental wellness screenings to the community. In an effort to reach individuals across Monterey County, CHS is providing this no cost event to connect people with the support services they need. Bilingual clinicians will facilitate mental wellness screenings to identify if an individual’s symptoms are related to depression, mood or anxiety disorders and to connect them with the appropriate services. The Family Service Centers are located at 433 Salinas St., in Salinas and 1178 Broadway Ave., in Seaside. The event is open to all and free of charge. Anxiety disorders are the most common mental illness in the United States, affecting 40 million adults age 18 and older, according to the National Institute of Mental Health. The vast majority of clinical depression cases can be effectively treated. Screenings are often the first step in getting help. Community Human Services’ Family Service Centers offer affordable & supportive clinical behavioral health services year-round to people of all ages.